PLEASE NOTE! This is a full day excursion and unfortunately not suitable for people with walking difficulties, especially at Carrick-a-Rede Ropebridge and Giants Causeway. I advise that you wear or can change into suitable footwear and have access to warm/waterproof clothing. Please note this tour is subject to additional third party costs for entrance fees. Any excursion ending with a stop off at the Giant`s Causeway really has to be worth it, but I am throwing in 2 extra stops. One stop at Carrickfergus Castle and a further stop at Carrick-a-Rede Ropebridge along with other necessary “convenience stops”. THIS IS REAL VALUE FOR MONEY! First we make our way to Carrickfergus Castle. 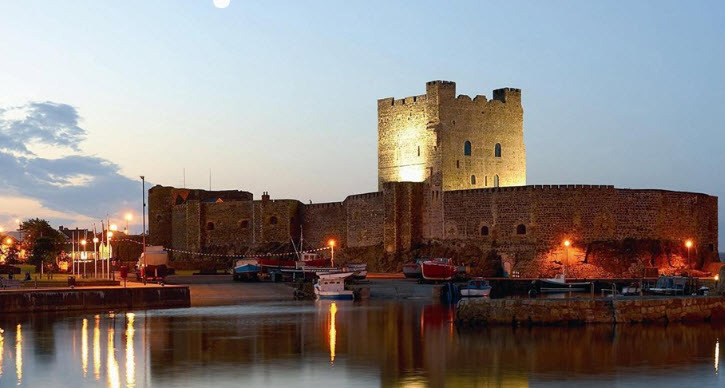 At Carrickfergus you will have approximately 1 hour to complete the Carrickfergus Castle Tour or chill out and visit one of the nearby coffee shops or restaurants for some refreshments. The choice is yours. Our journey then continues along the scenic A2 Coastal Route for the rest of our travel. 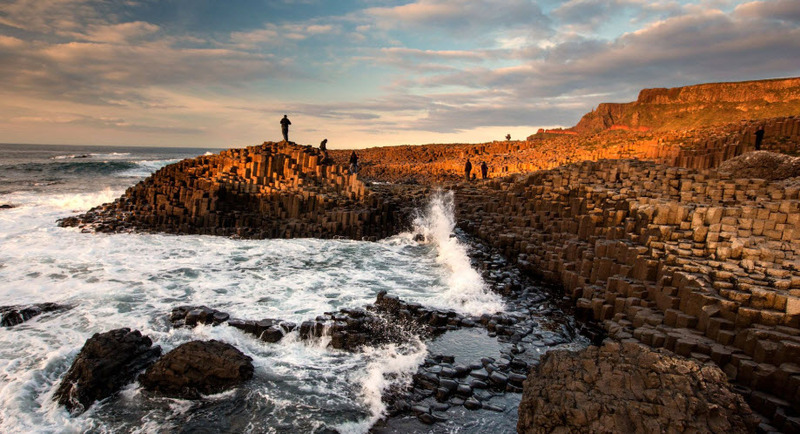 Along the Antrim Coastal Route you can enjoy some of the finest coastal scenery to be had, from the limestone cliffs and headlands, sweeping valleys, rocky bays and sandy beaches, across the Irish Sea to Scotland and the Isle of Man. Breathtakingly beautiful. Our next stop is the Carrick a Rede car park overlooking Larrybane Bay. Here you can access the Weighbridge Tea Room and public toilets. There is now a Timed Ticketing System in force at this location. The rope bridge is a very popular tourist destination and can be extremely busy at certain times. 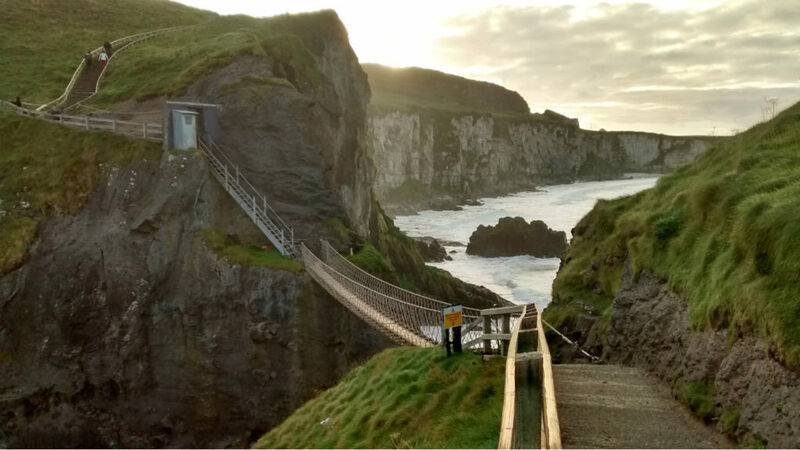 At peak times, I have known there to be a 2 hour wait to cross the bridge to Carrick a Rede island which is a 1km walk along the cliff path from our carpark. I am flexible on time at this location for those who wish to cross the bridge. Bear in mind that we have to travel on to our ultimate destination, the magnificent Giant’s Causeway, an Area of Outstanding Natural Beauty and now a World Heritage site. 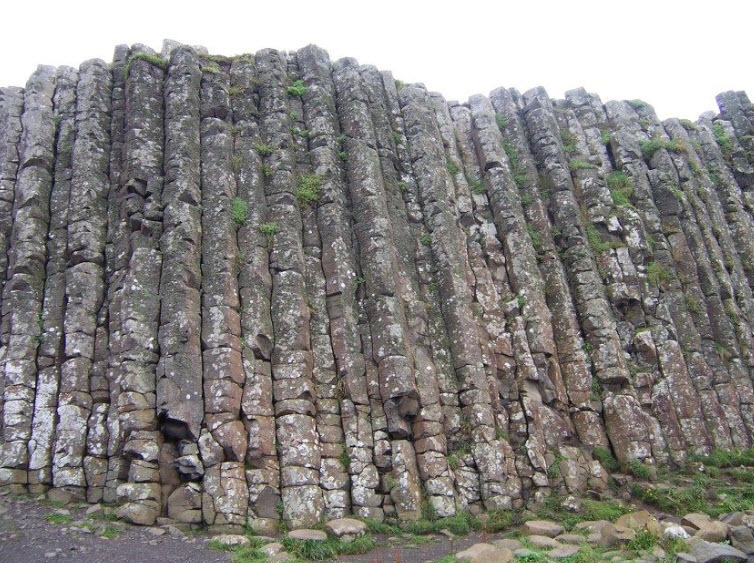 The length of time we have to spend at the Giant`s Causeway will depend on our time of arrival. From previous outings I have found that 2 hours is more than enough time to walk or bus down to the stone formations reaching out into the North Atlantic Ocean and the awesome “Pipe Stacks” further along the cliff face. You can opt to pay £8.50 each to go into the visitors centre to access the café, toilets and gift shop or I can direct you to access the Causeway for free. When you return to the vehicle we can discuss the route home. Maybe you fancy a coffee, a bite to eat or a “wee dram” or such in “The Nook” local bar which receives mixed reviews in Tripadvisor – OR – I could take you somewhere else for refreshments. The choice is yours (within reasonable distance and time). All in All, you will have experienced a great day out.